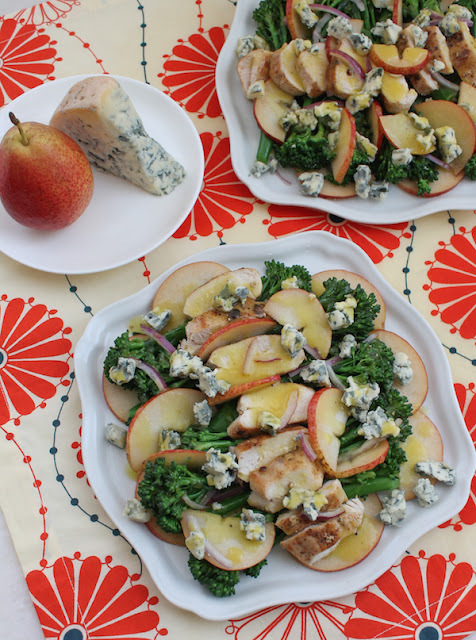 Who says greens have to be leafy to make a great salad? 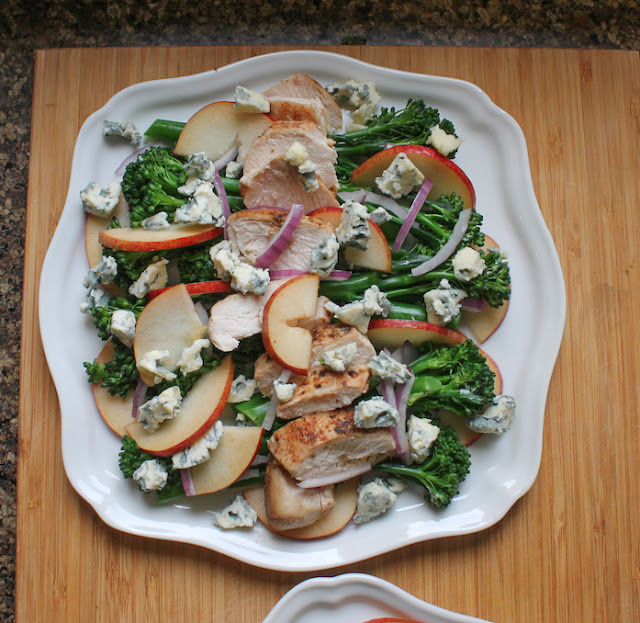 Lightly cooked broccolini adds great flavor and bite to this wonderful recipe for broccolini chicken pear blue cheese salad. Growing up, I was never a fan of pears because of their texture. I found them a bit gritty, for want of a better word. Recently I discovered that they aren’t all that way and I have been converted. In Dubai, we have produce imported from all over the world so, as long as you are willing to pay the price, choice fresh fruit is available year round. I try to buy what’s in season closest to me with occasional special treats of produce from farther afield. The pears that convinced me were Coscia pears, an Italian variety. I first liked them baked into an almond pear bread pudding but then decided they were pretty good raw as well. When I looked them up, the interwebs told me that they were granular in texture, but I didn’t find that true at all. Maybe mine were special but I’ve bought them a few times since and, while they aren’t as smooth as apples, they aren’t as gritty as the pears I recall from when I was little. Like the crunchy green bean, tomato, chicken and pearl couscous salad I posted earlier this month, this salad can also be served without the chicken. But when I am serving it as a main course, I think the additional protein helps make it a more filling meal. As another bonus, it can also be made ahead of time, which makes it perfect for a packed lunch at school or at work. Or for serving dinner guests. 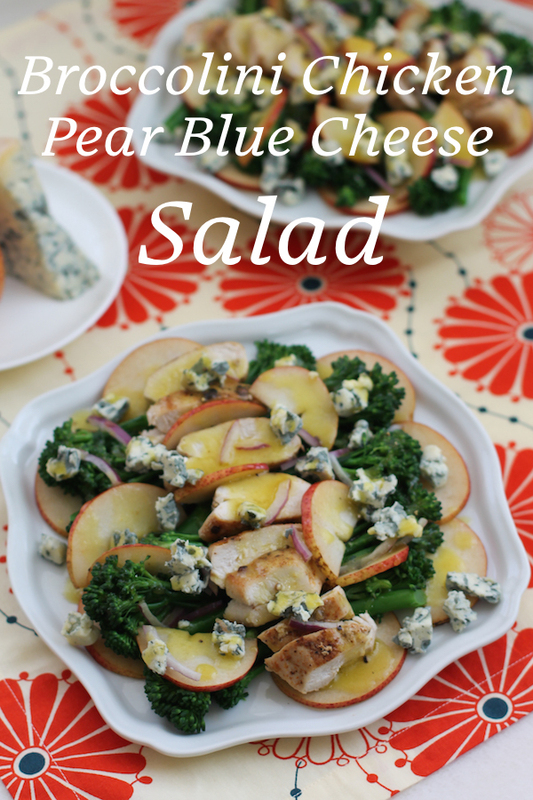 Pears and blue cheese are a classic combination of sweet and salty, especially if you have crisp pears that are just ripe and fragrant with pear-y-ness. 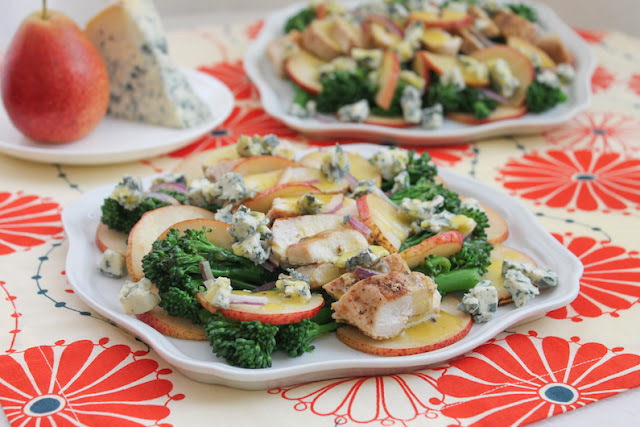 Together they lift the broccolini and chicken into something fabulous. And whether the salad is served slightly chilled or at room temperature right after you make it, the warm honey mustard vinaigrette is the perfect dressing. Season the chicken breasts with the salt and two peppers. Pan-fry them in the olive oil until golden on both sides and cooked through. Depending on the thickness of your breasts, this could take as few as five minutes and as many as 10. Do not overcook them or, as we all know, chicken breasts dry out. Remove from the heat and leave to cool. Meanwhile, put a pot of water on to boil and fill a bowl with cold water and some ice cubes. When the water comes to a boil, pu the broccolini in careful so you don’t scald yourself with a splash of boiling water. Set a timer for two minutes. 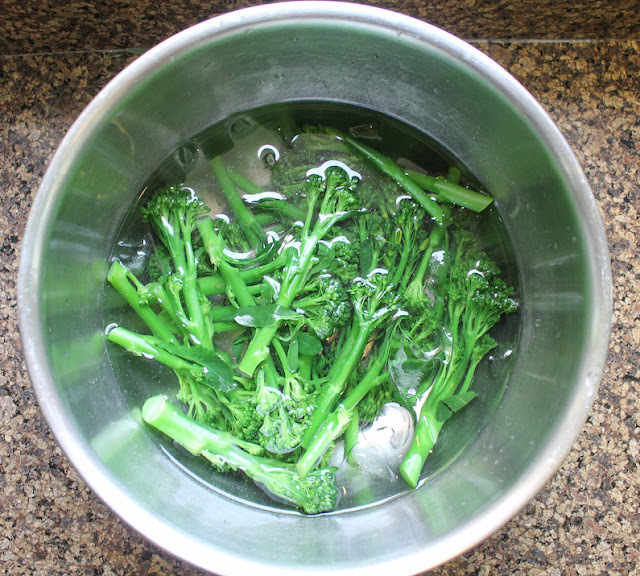 When the timer rings, scoop the broccolini out with a slotted spoon and pop it directly into the ice water. This ensures that it stays brightly green. Once chilled, remove the broccolini, drain and leave it to dry. Cut the chicken breasts into 8-9 slices each. 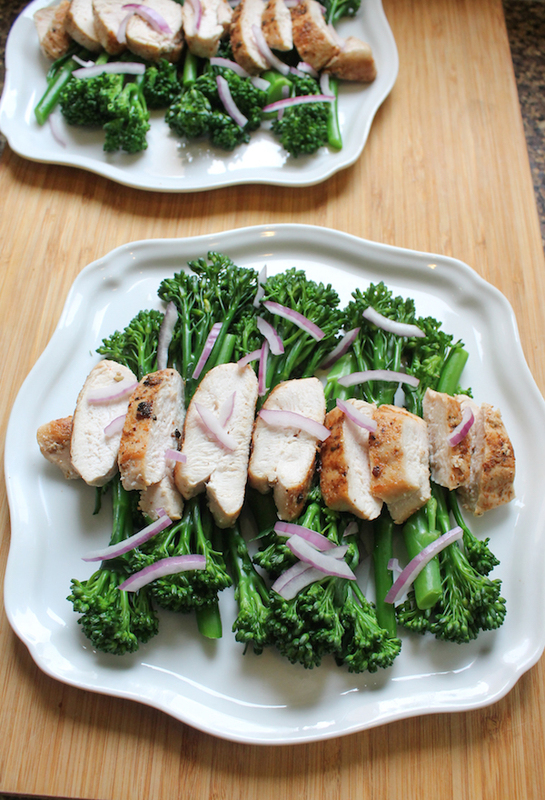 Divide the broccolini between two plates and add a sliced chicken breast to each. Add the sliced onion. Core and thinly slice the pear on top of the broccolini. Crumble the blue cheese on top of both. At this point, the plates can be chilled, covered with cling film, until you are ready to serve. Remove the plates from the refrigerator about 20-30 minutes before serving to allow time for the salad to warm up a little. 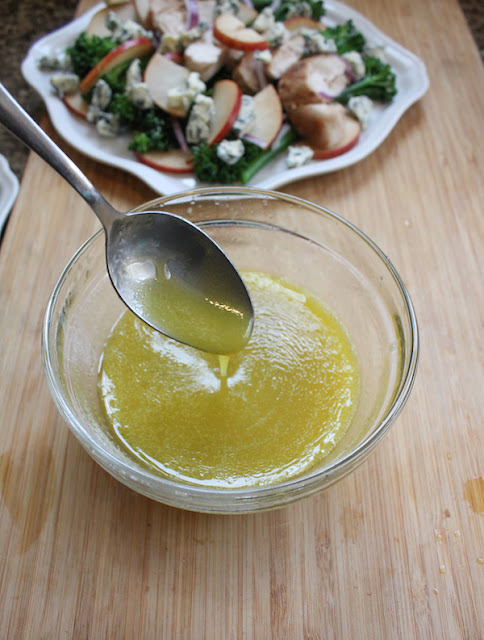 To make the warm vinaigrette, whisk all of the ingredients - except the oil - together in a small pot or microwaveable bowl, then warm the mixture gently over a low fire or with a couple of quick zaps of the microwave. Whisk in the olive oil, a little at a time, until the vinaigrette has emulsified. Add salt and pepper to taste. 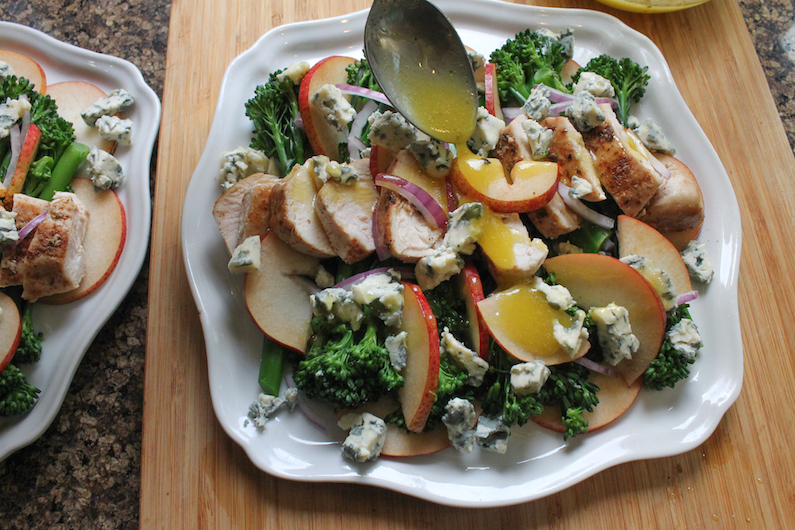 Spoon the warm honey mustard vinaigrette over the salad.